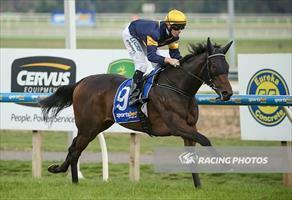 Three runners for the team at Ballarat on Thursday following our double on Wednesday and all with winning chances. Lady Loft is the first to go in the second race, the Fillies and Mares Maiden over 1000m. An encouraging recent jumpout pleased Mike Moroney enough to go straight to the races. “She’s been going really well and the last jumpout was encouraging,” Moroney said. “It looks like we’ve struck a strong field but it looks the right race for her and there is prizemoney on offer as opposed to giving her another jumpout. Lilymorn (pictured) is racing for the second time this preparation in race eight, a Fillies and Mares Benchmark 64 Handicap over 1400m. “We are very happy with her, her last piece of work was excellent,” Moroney said. “She’s always shown us good ability and now as a four-year-old I think she’s ready to show it. “She’s still got some improvement left in her but I couldn’t be happier with the way she is coming along. Hurry completes the day in race nine, the Fillies and Mares Benchmark 64 Handicap over 1200m. Moroney is aiming to ride the mare a little more conservatively having looked at the form in the race. “There does look a fair bit of speed in the race and she’s drawn wide so we might just look to be a bit careful with her early and look to take a sit,” Moroney said. Patrick Moloney rides all three on Thursday.